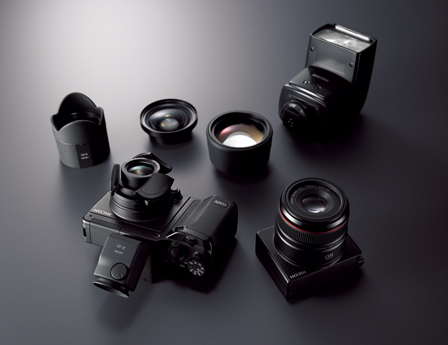 Ricoh has announced the GXR system, essentially it brings to reality a concept some people have talked and dreamed about since the digital imaging revolution began, a system with swappable sensors. Ricoh has taken the concept a bit further and released a system more akin to the not-yet-released Red Scarlet than, say the Lumix GF1. 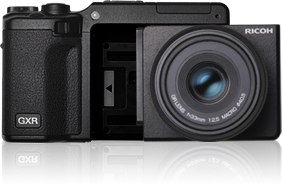 The GXR system includes a camera body with swappable lens-sensor modules. This enables a great deal of flexibility in system design and allows the development and optimization of lenses to sensors. This means you have the GXR body, and just plug in the module for the lens and sensor you want to shoot with. 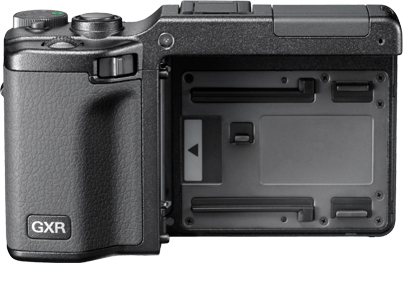 In fact, it’s really the awesome concept I’ve been waiting for in a digital camera, it means I can carry along a point-shoot small sensor module for snap-shots and a large sensor module for high-resolution images. It means I don’t have to carry aound a DSLR and a Ricoh GRD or a Canon G10, I’ll have the portability and high image performance options all in one system. Absolutely awesome! The GXR system is being released with a body and two lens modules including the A12 50mm F2.5 MACRO and the S10 24-72mm F2.5-4.4 VC. The 50mm will include an APS sensor while the S10 module appears to have the same type of sensor as the current GX200. Additionally the current accessories include a wide angle and tele-photo adapter, as is currently offered for the GX200, as well as a decent flash and an optional external electronic viewfinder (VF-2). So, currently it looks like a cool slick little camera system, but people like to buy into camera systems, what promise does the GXR system hold for the future? The control layout and design of the GXR body is very similar to the rest of the GR and GX lines. Meaning it’s more or less the best design being offered in a compact camera with good customization ability and excellent ergonomics. The body is magnesium alloy and the LCD screen is a High-definition 3.0-inch 920,000-dot VGA and a pop-up flash is integrated as well. The actual body is about the same size as the Lumix Micro Four Thirds GF1 from Panasonic, and is a bit larger than the GRD/GX body. So, it has a great size, smaller than a DSLR and is on par with the current camera-to-beat in this class, the GF1 (or the Olympus E-P2). 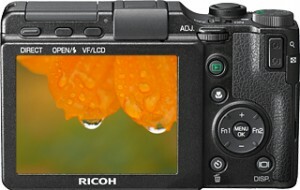 How can the Ricoh GXR system compare the Micro Four Thirds offerings from Panasonic and Olympus? Two big draws of the GF1 and E-P2 (or E-P1) systems is size and flexibility. Both systems are compact, smaller than a DSLR, but with a reasonably large sensor. They include HD video capability, and via lens adapters they offer the ability to create a tailored system to your individual style of shooting. If you want to use your Leica lenses, there’s an adapter for that. Contax or Nikon? There’s an adapter for those two. With the HD video options these cameras can be compact movie shooting machines in the palm of your hand with great image quality and use of Bokeh due to the large (as compared small sensor cameras) sensor size, nearly on par with offerings from DSLR cameras. Well, if Ricoh has the plan in mind I have in my mind, then the GXR system should be able to equal and actually surpass the capabilities of the Micro Four Thirds and some DSLR systems in a number of ways. Now, there are some people who’ll jump to the conclusion (withouth really thinking), “But it’s a closed system! With the micro 4/3 system you can use nearly any lens from Leica to Nikon!” And this is just the sort of thinking which makes me think people just want to defend their camera system no matter the facts of reality. The real beauty of the GXR system – the reality, is that a great deal of the image processing, lens motors, focusing, etc. is included in the lens module. So how hard is it going to be for Ricoh to develop a lens module for manual focus lenses like the Leica M, Nikon, Pentax, etc. via one module and an assortment of adapters? Not very hard at all, and if they’re smart (and I know they are) it’s a sure bet that such a module is in the works, and if they’re really smart it’ll be on the market in early 2010. It should even be possible (and no, I don’t think this one will happen) to create a special module for Contax G lenses (but it would be freak’n awesome). The lens module system also means that different modules can be optimized for different file formats. For example, of the first two modules, the S10 24-72mm shoots VGA video while the A12 50mm F2.5 shoots full HD video. 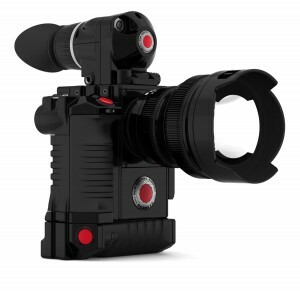 You should eventually be able to build the exact system you want, an optimized HD video system for Cine lenses, an action package for sports, a high resolution wide angle system for landscape, a fast aperture system for street shooting, much like the Red Scarlet system (original system image included here), it’s an awesome concept. How about an ultra low-light module? The possibilities are really exciting. The Ricoh GXR system actually holds the promise of what a lot of people have been asking for, and now they might not fully realize it has arrived. The GXR system is the most modular and flexible ever proposed, and I’m highly anticipating the release. It’ll be the perfect system for different types of shooting and offers the customization that many consumers are interested in. I’m putting off my ambitions to pick up a Lumix GF1 and will look at the GXR system, it simply offers too much promise for customization and system tailoring that I’ve only dreamed would exist, it’s just too much to ignore.